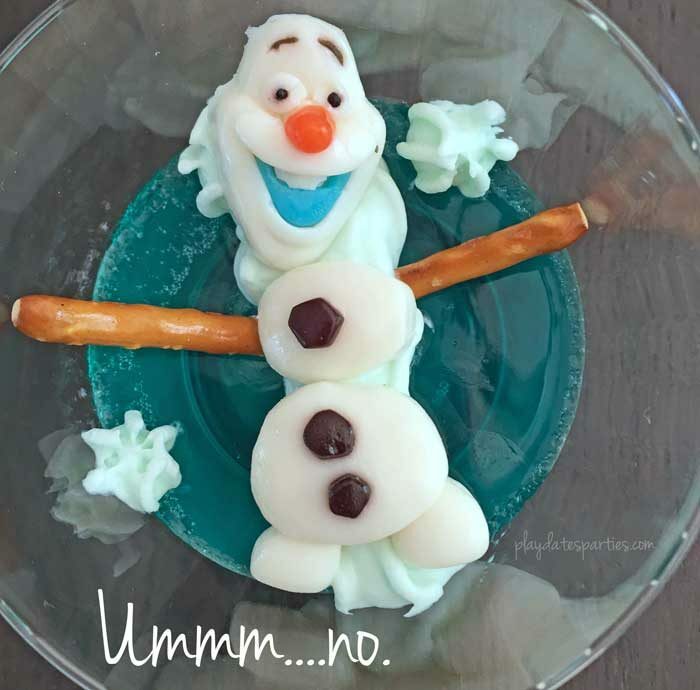 These floating Olaf Jello cups are surprisingly easy. In 3 simple steps, you can have the perfect Frozen-themed snack for your kid’s Frozen-themed party. Have you ever seen something awesome on Pinterest, only to realize that there’s no explanation on how to make it? That’s what happened when I started planning my 4-year-old’s Frozen themed birthday party last summer. Like 2.7 thousand other people before me, I found the image below on Pinterest and saved it to my party planning board. Weeks later, I came back, only to find that there is no additional information on how to create that adorable floating Olaf. It looks like it was made from a custom candy mold, but aside from that, there were no real leads. So I scoured Amazon, Hobby Lobby, Etsy, and Michaels for Olaf chocolate molds, but nothing I saw seemed to look like the right size. And did I mention that I’m not much of a candy artist? If I attempted to make a chocolate Olaf, the results could be disastrous. But since my daughter loves Olaf so much, I was determined to replicate it somehow. Then, I happened upon these cute little Olaf gummies on Amazon. They weren’t as big as the original inspiration, and with 5 sets of gummies in each box, I knew that they were the perfect way to make my own version of that cute jello salad. Mix the jello according to package instructions. Pour the jello mixture into the plastic cups before setting. Fill the cups about halfway. When the gelatin is set, place the Olaf gummies onto the top of the gelatin and enjoy! 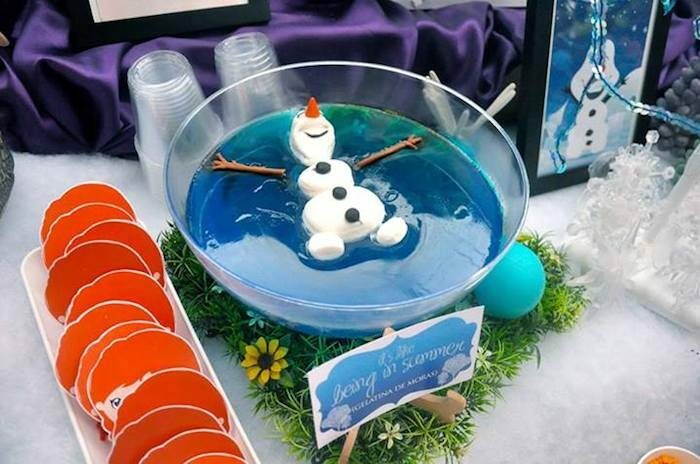 You may be looking at these floating Olaf jello cups and wondering where the arms are. Well, my original plan included adding pretzels to the cups for Olaf’s arms, but nothing I did looked quite right. In the end, just the plain gummies worked best. And the kids didn’t care at all that Olaf was missing a couple limbs. Gummies can get a strange, spongy texture if they sit on or in jello for very long. Since some kids don’t like that, we mixed in a few cups that had snowflake sprinkles on top. None of the kids argued over who got what jello, and it was a great way to save a few cents. Mixing the gelatin and pouring into the cups takes only five minutes. But you’ll need to have refrigerator space to let them set up for at least 3 hours. Not long before the party starts, it takes about 10 minutes to get the gummies placed nicely on all the cups and to arrange the cups on a tray. * It looks like the gummies aren’t in stock right now, but my research indicates that they will become available again in 2017. Definitely! Even though it wasn’t as large as the original inspiration, they were a huge hit with the kids. Honestly, what kid wouldn’t like gummies or jello? But don’t feel limited to making these for a birthday party. Since I found a way to make them in individual sizes, you can make them as a special treat just about any time you like. 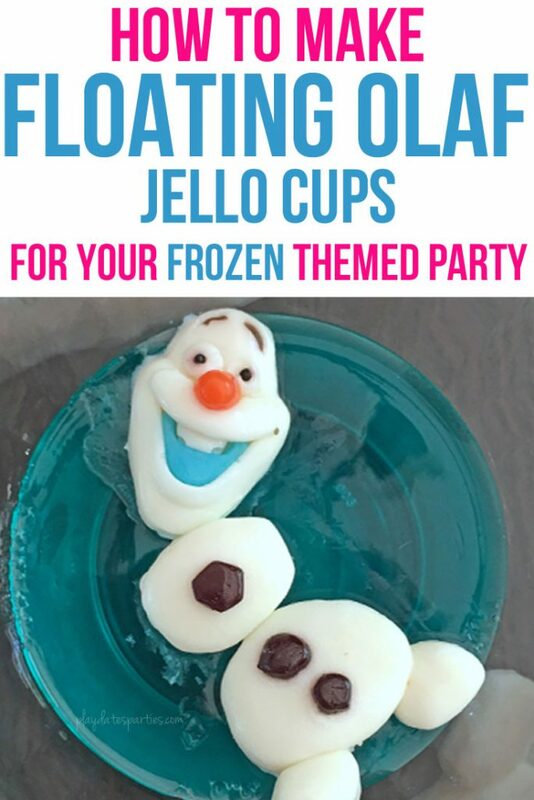 Would your kids want floating Olaf jello cups? Have you ever been disappointed by a Pinterest image that went nowhere? How did you recover? Share your stories in the comments section. And if you’re stuck trying to figure out how to make a pin you love, send it to me and I’ll do my best to recreate it! Thanks for sharing. I love this idea and I think my daughter will be happy to see them. Oh, I hate when pins don’t lead anywhere – unless it’s something obvious and you don’t need directions. I LOVE these though. My eldest niece and nephew would love them just for a cute treat someday. Oh you know I love this one! I need to grab some Olaf gummies STAT 🙂 Pinned! These are adorable! My daughter (who is 23 😉 ) would absolutely love these. Thanks for sharing! She’s coming home for summer. i’ll have to surprise her with them. This is so cute! I wish I had seen this in Decemeber when I hosted a frozen party for my three year old. How cute! I just might make one for me. These are so cute! My toddler would loves all things Frozen. Thanks for sharing with us at the Family Joy Link Party! So-oooo adorable and do actually doable. Thanks for sharing at the #ThisIsHowWeRoll Link Party. These are very cute. I can imagine that they were the hit of the party. Olaf just makes people smile. Thanks for sharing at the To Grandma’s House We Go link party. Congratulations! Your post was my feature pick at #ThursdayFavoriteThings this week. 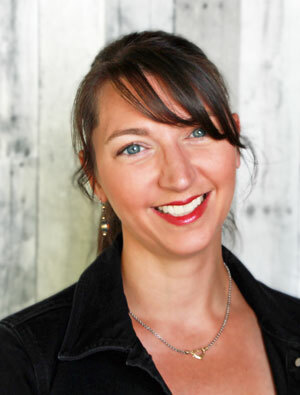 Visit me at http://www.marilynstreats.com on Wednesday evening and to see your feature and grab your badge! All hosts choose their own features so be sure to return to my blog. I invite you to leave more links to be shared and commented upon. Thanks for bringing your cute recipe to last week’s Pit Stop. These are just so cute! I did a Frozen themed party for my daughter 3 years ago and these would have been perfect! 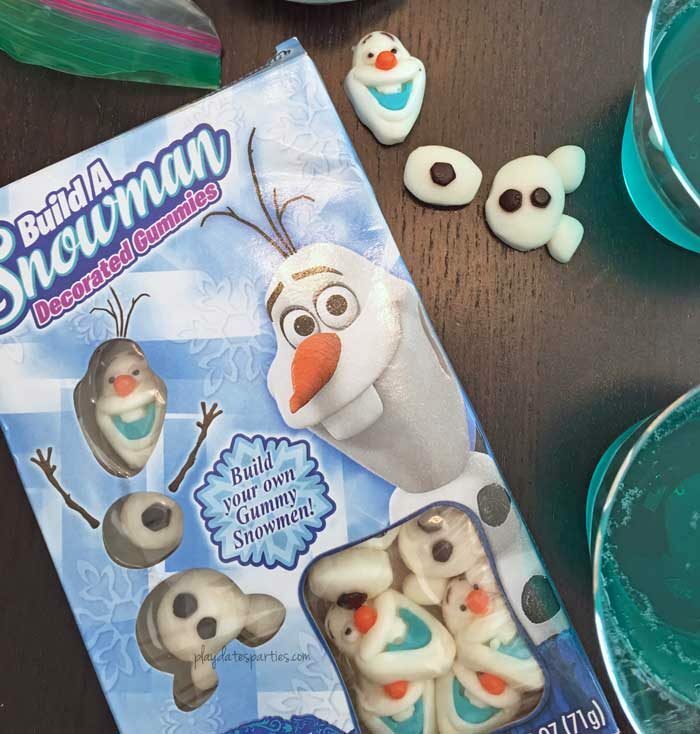 Such a good idea thinking to use the Olaf gummies. Thanks so much for sharing at the Friday at the Fire Station link-up! Skype has opened up its web-structured customer beta for the entire world, right after starting it broadly within the United states and You.K. earlier this calendar month. Skype for Internet also now facilitates Chromebook and Linux for instant online messaging connection (no voice and video but, these need a plug-in installment).